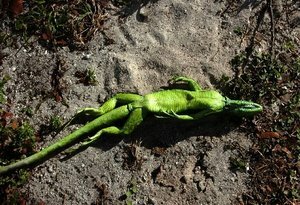 Iguanas are having a problem with the current cold snap here in South Florida. They're dropping from the trees. On my morning walk I saw some immobile anoles, wouldn't move even when I touched them. Some bigger guys in Miami felt the cold, too.